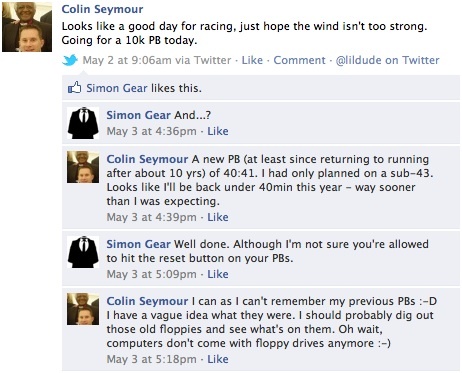 My cousin has a fair point there, I shouldn't really be resetting my PBs, however my response did get me thinking... maybe I should dig out those old floppies and see if I can extract the data from the old application, Gotorun, to see what I could find. Well, thankfully I DO still have an old laptop with a floppy drive. It wasn't long before I had all the data off the floppies and stored in image files for manipulation later. The next day I set to hacking my way through the database files to see if I could work out what database was used and then export the contents to CSV. It didn't take long and thanks to the Linux and open source community, I had my data exported from the proprietary database to CSV and imported into an OpenOffice spreadsheet. A little more tinkering and I'd extracted all my races into tabs by distance so I could easily see how I'd done all those years ago. I seemed to have suffered a major data loss at some point as I know I'm missing entries and a lot of the early entries had the comment "Re-entry after data loss" for their "Notes". It was around about March 1998 that I started getting quite good at documenting my training and racing. Prior to that I didn't record much, though I suspect this may be due to not having discovered Gotorun at that stage or, as I mentioned above, I'd had some sort of data loss. I WALKED a half marathon with my girlfriend at the time and "Vowed never to walk a half marathon again." This made me smile. I still stick to this rule. 5km: 18:35 on 26 Jan '99 - I seem to only have one 5k on record and it's one of my last runs in SA. 10km: 36:52 on 31 Dec '98 - Yes, I raced a nite race on new year's eve. 32km: 2:36:56 on 23 Nov '97 - I know for a fact I ran this race in '98 too, but this entry seems to be missing. 42.2km: 4:11:13 on 22 Feb '98 - My one and only marathon, used to qualify for the Two Ocean's Ultra marathon below. Terrible time due to inexperience and getting caught out by a 2-lap course. Interestingly, I did record a quicker 10k time of 35:37 on 30 Jun '98 but commented "Short Course" in my logs so I'm discarding that quicker time. I also recorded a quicker 8k time of 20:24 which I also determined to be a very short course. All but my marathon times are really good and certainly provide some big challenges for me if I'm going to get back to that level before I get too old. For those that are curious, you can take a look at the spreadsheet via Google Docs here.